For one day only, we're opening a comedy club you can summon with the press of a button, and that takes you where you need to go. Tigran Gevorkjan and Mattias Naan will entertain you along the way. You can order the comedy van with Taxify app, where you'll see a special price category "Comedy" on Oct 3rd only. This 6-seater van is priced in Taxify's most affordable category, but drivers Naan and Gevorkjan have said they wouldn't want to charge a great audience. To our knowledge this is a world first: never before has there been a possibility to order a comedy club which drops you off to work or home. 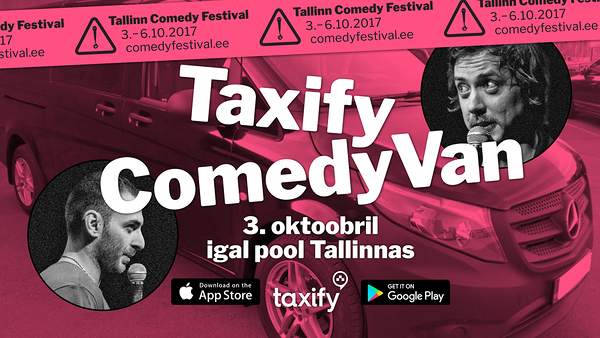 Taxify ComedyVan operates only in Tallinn on Oct 3rd between 3pm and 7pm.